I found this recipe, and on a whim, decided that it just might be worth making. I am so glad I did. What a wonderful, healthy alternative to bread dressing for your holiday table. This is healthy, vegan, gluten free and most importantly delicious. I don't think my family would mind if I added this dish to my Thanksgiving menu this year and served it along side my regular bread dressing for those guests wishing a lighter stuffing to enjoy with their turkey. If you've never tried or cooked with quinoa before, THIS is the recipe you need to start with. Here are a few fun facts about quinoa: Quinoa is a pseudo-grain that has high nutritional value. It is high in protein, fiber, magnesium and iron. It is considered a complete protein. It's a great food source for vegans and is gluten free. It is easily digested. Quinoa has that distinctive "bite" when you eat it...something that I love about it. You can buy quinoa pre-rinsed. But if you don't be sure to rinse it before cooking to eliminate any bitter taste. This recipe calls for poultry seasoning. I make my own from the recipe you can find HERE but in addition to the ingredients listed, I add thyme. I also scale the recipe down to 5 servings instead of 64! I keep it in an airtight glass jar. Of course, you can just buy poultry seasoning as well. This stuffing would make an excellent side dish for any type of poultry or pork. Heat 1/2 TBS olive oil in a medium sized saucepan. Add in quinoa and stir until evenly coated. Cook for about one minute on med-high heat. Stir in broth, poultry seasoning, and salt. Bring to boil. Reduce heat to low and cover. Simmer for 15 - 20 minutes or until all the liquid has been absorbed. In a small non-stick skillet, heat the other 1/2 TBS of olive oil over med-high heat. Add in the onion, celery and mushrooms. Cook until the vegetables are tender, about 8 - 10 minutes. Combine cooked quinoa with vegetables. Season with black pepper. This is such a great healthy side dish for so many reasons. The taste of traditional bread stuffing is definitely there thanks to the poultry seasoning. 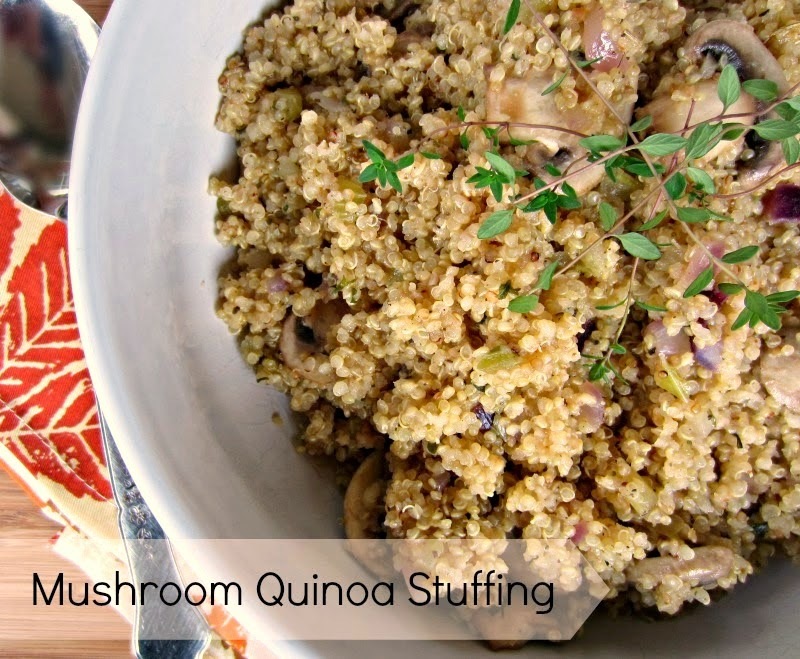 Is this quinoa dish something you would consider adding to your holiday table this year? What a great alternative to traditional stuffing. I think quinoa is perfect for Thanksgiving! It was much better than I had thought it would be! Give it a try Nicole! This looks amazing! I need to pick up some mushrooms and quinoa this weekend. Two ingredients that I'm (sadly) missing my fridge. Definitely worth trying! Esp if you like quinoa! I never get over here as much as I would like, but I love visiting your blog--especially your new "Out of the Kitchen" posts. I don't know about me and quinoa--still trying to find a spot for it in my life, but this recipe looks fabulous; I may just add this to my Thanksgiving menu. HI Mel!!!!! So glad to see you! I'll be honest, this was my first attempt at cooking quinoa at home. It was as easy as making rice...no lie. I've had it in deli salads before and liked it alot. Give this one a try. It's really good! you must try...it's as easy as making rice...but I like quinoa better than rice! That's a great healthy alternative. I don't cook Thanksgiving fortunately haha. But I will pin this to share with others looking for a great healthy option. Thank you for sharing at the DBB! thanks for stopping by Emily and thanks for pinning! This is great for someone needing a gluten free alternative! I'm a huge fan of quinoa... and stuffing (which I feel like we all need to eat more often and not limit to holidays. hah!) This stuffing looks great and I love that it's vegan and gluten free! I like it too. Husband isn't very fond of it nor couscous, so I don't make it as often as I could. I love quinoa! This stuffing sounds wonderful. I'm going to have to try this recipe. I have shared and pinned it to try in the future. This looks awesome! I have to try it!!! Thanks for the review! So glad you liked it!